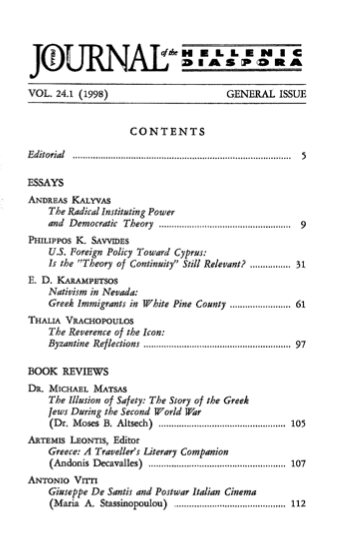 In October 1987 the Journal of the Hellenic Diaspora printed an article by George Pilitsis titled "Apotropaic and Other Magic Devices in Greek Wedding Rituals." Reading the article brought back memories of stories about my mother's Thea Petrakina. 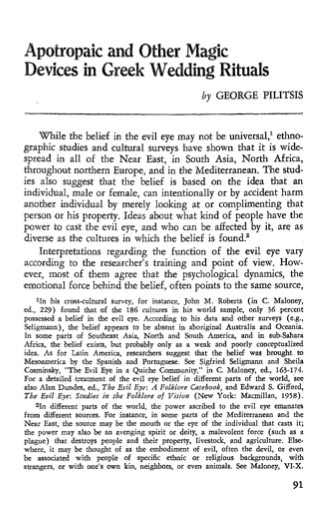 She was my maternal grandmother's "go to" person for all issues regarding the evil eye. 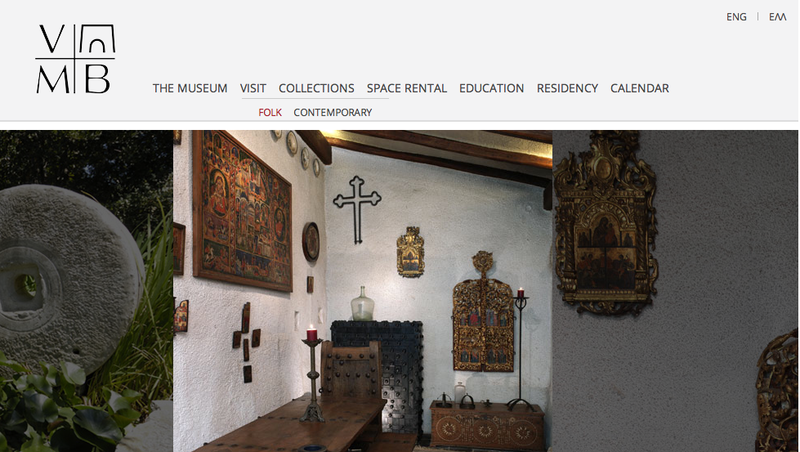 The Vorres Folk Art Museum, known as Pyrgi, created by Ian Vorres, is justly considered today as an essential unit of Greece's traditional folk art institutions. . . . . Surveying the gardens and the interior spaces of the Museum complex, joined into a well-conceived aesthetic and impressive whole, and viewing the various categories of categories of exhibits, many quite unique, (like the best collection in Greece of the so-called "syriana" ceramics coming from the island of Syros, a special study of which is now being completed), the visitor is immediately taken by the sensitivity and refined eye of the collector and the scope of his achievement which aims at revealing the rich facets of Hellenism. by William H. Samonides, Ph.D.
1904 was a momentous year. Internationally, the beginning of the Russo-Japanese War in the Pacific hastened the collapse of the Russian empire, imperiling the lives of tens of millions of Orthodox Christians. Nationally, the World's Fair and the third modern Olympic games in St. Louis preceded the election of President Theodore Roosevelt. In New York, the modern city was taking shape: construction began on Grand Central Station, and the first underground stretch of the subway went into operation. 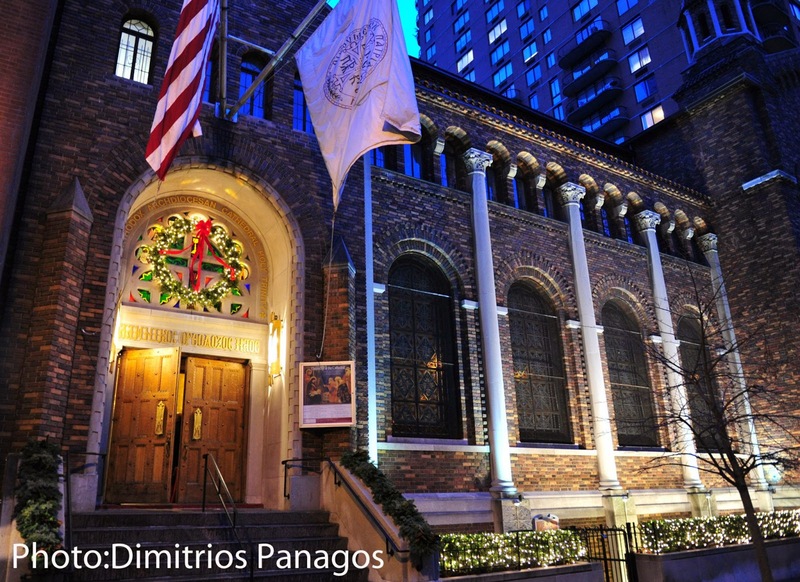 There were also major developments at Holy Trinity, the first Greek Orthodox parish established in New York. In April 1904, the Holy Trinity parishioners purchased their first building, and later that year a new priest, 40-year-old Fr. Methodios Kourkoulis (1864-1941), arrived from Greece. This looks so interesting, I will definitely put it on my list of places to visit the next time I am in Athens. The Museum of Greek Folk Musical Instruments - Center for Ethnomusicology inaugurated on June 6, 1991, and is a public entity supervised by the Ministry of Culture. It is based on a collection of 1200 Greek folk musical instruments from the 18th century to the present day, . . . donated in 1978 by Phoebus Anayanakis. In a reception organized by the Consulate General of Greece in Vancouver and the Greek community of Victoria, a unique collection of Greek traditional costumes was donated to the Greek Folk Art Museum. The Consul General of Greece in Vancouver, Ilias Kremmydas, received the collection for the Folk Art Museum and Greek Popular Musical Instruments. The collection was donated by Elizabeth Gage, who had inherited it from her aunt Winifred Dowding. According to Gage, her aunt acquired the rich collection when she served as a nurse in Greece during World War I.
by Professor Pio, of Denmark, in a recent number of the Hamburger Korrespondenz. 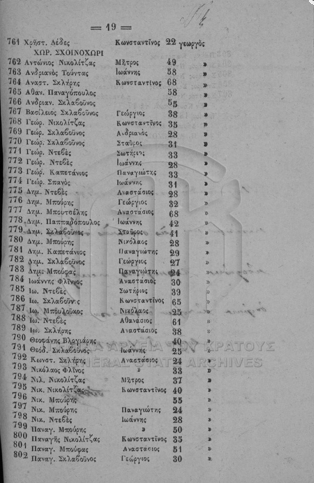 FamilySearch.org has a FREE database titled WEST VIRGINIA NATURALIZATION RECORDS,1814-1991 which includes 2,624 people showing Greece as their place of birth. You will be able to view original documents online. 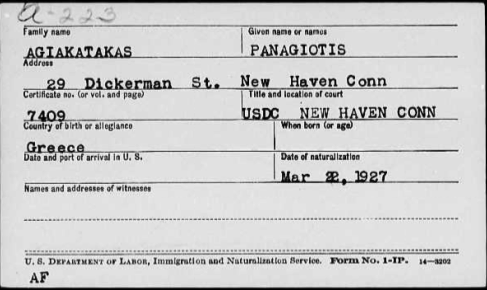 FamilySearch.org has a FREE database titled UNITED STATES, NEW ENGLAND PETITIONS FOR NATURALIZATION INDEX, 1791-1906 which has 2,075 index cards for people born in Greece.